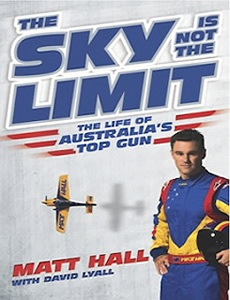 The Sky Is Not The Limit – the life of Australia’s Top Gun , written by Matt Hall and co-authored by David Lyall, is a walk through the extraordinary life of Matt Hall. The biography, that has been a lifetime in the making and two years in writing and editing, will give readers an insight into Matt’s love affair with aviation, his time in the Air Force including a graphic account of his service in combat over Iraq, the trials and tribulations of the Red Bull Air Race and Matt’s lessons on chasing your dreams. The thrill-a-minute tome, with a forward by Air Marshall Geoff Brown AO, the Chief of the Royal Australian Air Force, will captivate, inspire and entertain, all the while encouraging the reader to be the best they can be at whatever they choose. The book, published by ABC Books, will be in stores on January 22, 2013 for $32.99. Matt will also be travelling the country promoting the book in late January and February next year including at the Australian International Airshow at Avalon in Melbourne.